What causes spondylosis deformans in dogs? Spondylosis deformans in us dogs is a chronic condition that is associated with aging. Research indicates that it often develops as a secondary problem related to degenerative disease of the intervertebral discs. In the normal spine, the vertebral bones are joined by ligaments to form a flexible protective column around the spinal cord. 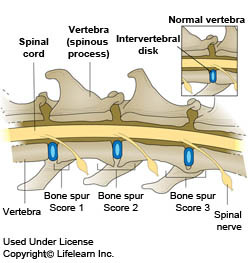 There is an intervertebral disc between each vertebral bone, and these discs act as shock absorbers and cushions. The series of joints that make up the spine give the back flexibility of motion while protecting the delicate spinal cord from damage. If the intervertebral discs do become damaged, the joints between them become less stable, resulting in abnormal motion. With spondylosis deformans, the intervertebral discs slowly degenerate as part of the aging process and the condition is not associated with inflammation. The bone spurs of spondylosis deformans develop to re-establish the stability of the weakened joint or joints. The formation and growth of the osteophytes or bone spurs are triggered by instability and it appears that they grow only as large as is necessary to reinforce the diseased joint. See your veterinarian if you notice any signs and keep a WiggleLess in mind for back support. The post Spondylosis Deformans in Dogs appeared first on WiggleLess®.